Thanks to all of you who read this blog! Thanks for your encouraging comments! I have plenty of ideas and projects already planned for 2012! Blue, Blue Christmas and Happy "Blue" Year? 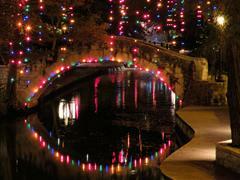 This year San Antonio "modernized" the famous River Walk holiday lights. Yes, we are talking about the lights that put San Antonio on so many "must see" holiday destination lists. This year they were changed to energy saving LEDs, and it's not without controversy. Earlier this evening, we took a stroll on the River Walk so I could see the new lights for myself. It's quite a change. Gone are the garlands of twinkling lights cascading over the trees and reflecting their soft glow on the water creating a magical walk along the river. They've been replaced with the blue glow of LED lighting. Out with the old bulbs and in with the new. So going green has turned the famous River Walk blue. It's not as bad as some of the comments I've read online, but somehow it lacks the San Antonio charm. It appears that the combined multi-colored lights blend together into a harsh, modern glare. The lights would work in Houston or Dallas, it just doesn't look like San Antonio. It's more than the River Walk going blue over this, I checked several sites where locals discuss issues and couldn't find a positive comment anywhere. I even found a reference to this as a "New Coke moment" for San Antonio. There are petitions out there to bring back the old lights. To be fair, they look OK; but if you have seen the old lights, they just don't have the same warm feel about them. "Bring a flashlight" was one helpful hint I saw online. It does feel rather dark. By contrast, Houston Street stayed the same with the white cascading lights. I enjoy showcasing my city in the best light possible, but sometimes I have to vote "thumbs down". This all went off track when the lighting designer decided that draping the lights over the trees didn't work and planned a new, updated approach with lights wrapping the tree trunks. It was approved with very little public input -- and even in spite of public objections. If we must keep the current lights, I think the draping effect would at least make them more acceptable. Along the way, someone forgot that the River Walk is all about the magic. Sometimes the modern and green approach ignores what makes a place special. The calendar shows 2012 as a Leap Year. And in gardening terms, It should also be "leap year" for my garden. There is a saying among gardeners regarding perennials that the first year they sleep, the second year they creep, and the third year they leap. In other words, after transplanting perennials, they need to first get established, then they slowly start to take hold, and finally -- beginning with the third year -- they leap into full growth. If that holds true, the perennials I began planting in 2009 should be "leaping" by early summer. Of course, the weather has to cooperate and that's sometimes a tall order here in south Texas. The big freeze in February 2010 and the heat and drought of last summer knocked some of the perennials for a loop. This creeping germander has been set back by the heat and spent last summer sleeping when it should have been creeping. It's beginning to creep a bit now so what will it do next spring. Will it leap or creep? The white-blooming lantana, salvia, and plumbago in this bed have definitely slept and crept, so even a little leaping would be appreciated next year. No doubt the Artemsia "Powis Castle" will leap. This Flame Acanthus has not disappointed so far with its growth and blooms last summer. I will enjoy seeing it leap and set even more blooms next summer. Will the Callistemon "Little John" (in the foreground above) recover from last year's deep freeze? This Firebush (Hamelia patens) is already growing well and setting blooms right through December. Should I expect even more next year? Is this the year Pomegranate "Wonderful" will set fruit? This Indigo Spires Salvia has already grown and bloomed beautifully these first two years, how much better will it look when "in-Spired" by leap year? Yes, this should be a great "leap year" in the garden. 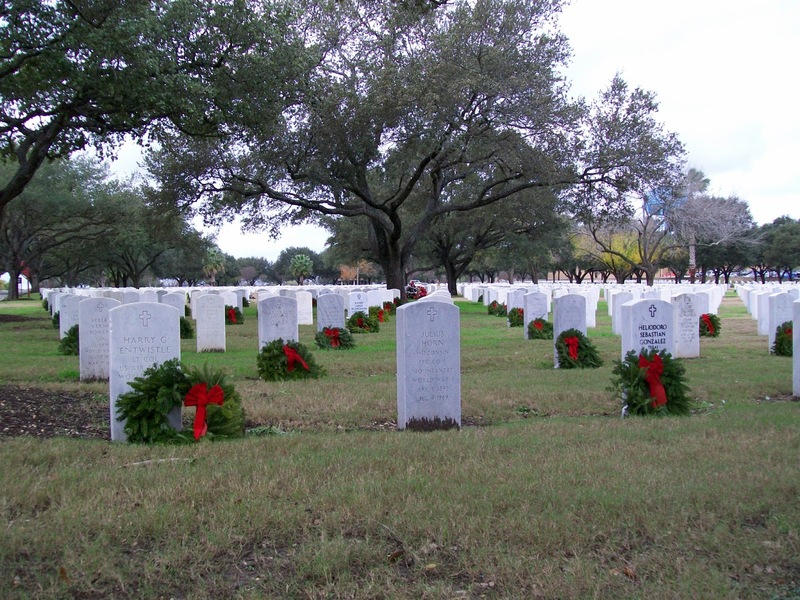 It's Christmas Time in Texas! "There may not be snow in San Antonio..."
"....but it's a Texas Christmas to me...."
The lone star shinin' bright....."
"Merry Christmas from Texas and me"
It might seem odd that a newbie garden blogger in Texas would be moved to write about the great landscape designer Wolfgang Oehme who passed away on December 15th. I never met him yet his influence motivated me to type out my thoughts here. I don't remember when I first heard the name Wolfgang Oehme, but I clearly remember the first time I connected with one of his landscapes -- I never forgot the experience. In the mid-1990's we were living in a suburb of Washington, DC and riding the Metro train almost daily. When the train pulled into the National Airport station that day I glanced over at the new parking garage and saw....trees, shrubs, and grasses; not just in front of the garage--but rather all over the garage. Trees, full size shrubs, grasses, and vines were being installed in horizontal boxes on each level of the structure. Wow! That's so different. What a contrast to the boring office buildings of Crystal City just behind it. It's a parking garage! Who did this? Eventually I learned the designer of this landscape Wolfgang Oehme and his now famous firm Oehme, van Sweden & Associates were at the forefront of a style called The New American Garden. I was intrigued and by intentionally choosing a seat on the north side of the train car as often as possible, I could see how the plants grew and changed over time. 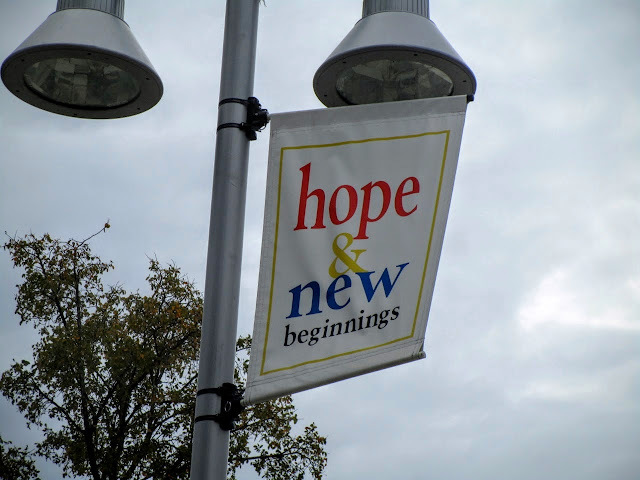 I began to note other installations around the Washington-Baltimore area. His work was always special and so different from the standard. Definitely thinking outside the box(wood). Arriving back in San Antonio in 2008, I noted an increased use of ornamental grasses in landscapes here and thought the trend could be Oehme's influence. Would this combination of perennials and ornamental grasses along the River Walk Museum Reach have been approved without his groundbreaking work? Would I have thought to do this to my little driveway island? 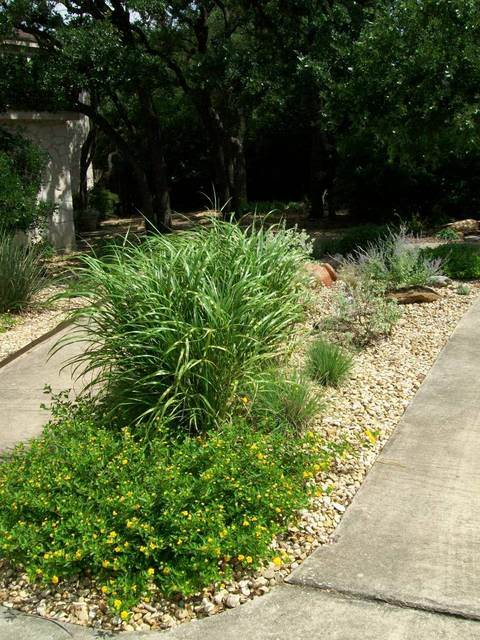 An article I read this week mentioned he often used Russian sage and ornamental grasses in combination. I'm not sure I knew that when I planted this spot, but it works beautifully. 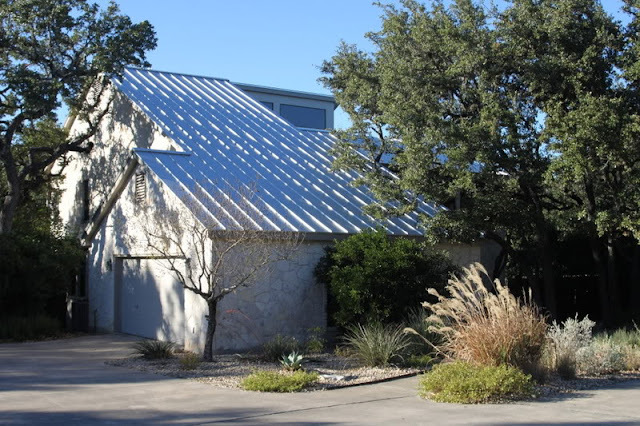 While my little front island garden here in suburban San Antonio is no match to the estate-sized swaths of grasses, wildflowers, and perennials for which he became famous, it does make me smile everyday. The past few days I've been remembering how much his work brightened my day from the window of a train for a few years. For Foliage Follow Up sponsored by Pam at Digging, I'm taking a rainy day tour of my yard. Rainy days have been rare around here for more than three years. For over a week now, it's rained every day. We aren't complaining since we need the rain and even with all this rain we are still down by more than 13" for the year. Not exactly the bright reds of a New England fall, but then we won't have to shovel more than a hundred inches of snow this winter. Rain is predicted through next Tuesday which would mean 11 rainy days in a row. Almost impossible to imagine just a few weeks ago. It's been raining for a week here so these are somewhat soggy blooms, but we can't complain about the rain. There have been a couple of frosty nights, but no hard freeze yet. 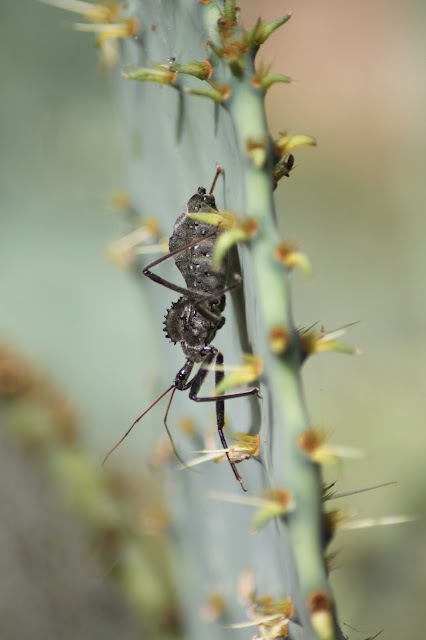 The Wheel Bug is known around here as the Stegosaurus bug which is just how it looks. Slow moving and over 2 inches long, but hard to spot; it certainly grabs your attention when you see it. More common in the eastern United States, Texas is the western end of its range. Surely San Antonio is the outer limits. 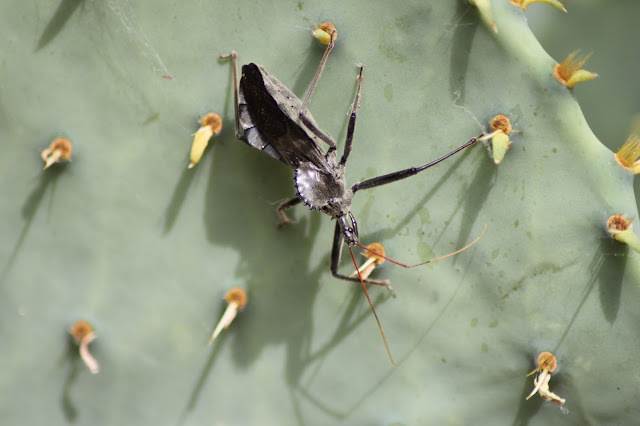 It's a form of assassin bug and blows poison out the "back end". I hope this one found plenty to eat since they are beneficial in the garden. This past summer we put out extra saucers of water around the back yard to help birds and animals weather the drought. Birds we had not seen here showed up to enjoy our hospitality. The Curve Billed Thrasher was one of the most striking with their intense yellow eyes and lovely song. According to All About Birds the Curve Billed Thrasher is native to the southwest and northern Mexico. It prefers to live in cactus and spiny brush so they might have spent their summer in the stand of prickly pear and oaks in the back yard. Update 12/13/2012 - These birds have been identified as Long-Billed Thrashers. An important difference as they are only found here in south Texas. Please reference the update here and check Sam Taylor's reply in the comments section. So where did the lawn go? Answer: we never had one. So let's see how the front yard got to its current state over the years. Our realtor wanted to keep driving when she saw the front yard, and did not want to even stop to show us inside the house. After moving in, the new neighbors and friends dropped hints that we should do something about the yard. The problem? 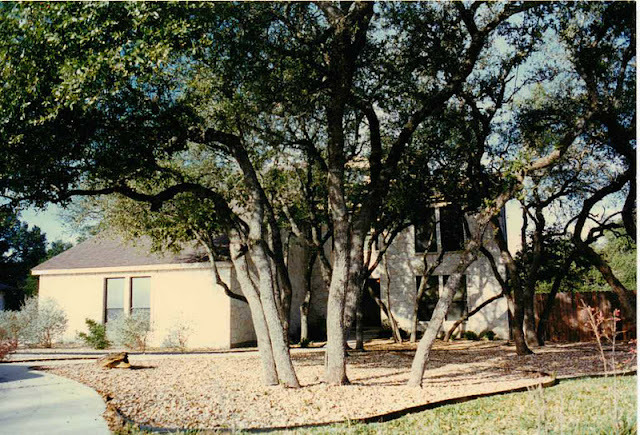 Just a sea of gravel under the live oaks with a few shrubs dotted around as shown in these scanned photos from 1995.